EuroCave Importers Ltd trading as EuroCave UK will treat all your personal information as confidential, although we reserve the right to disclose this information in the circumstances set out below. We will comply with all applicable UK Data Protection and consumer legislation. The EuroCave Company is committed to protecting the personal data and privacy of its customers and anyone who accesses its applications and websites. EuroCave undertakes to ensure the highest level of personal data protection in accordance with data protection legislation and applicable European regulations. The definition of personal data (hereafter termed “Personal Data”) is information relating to a natural person identified or able to be identified, directly or indirectly, by referring to an identification number or to one or several elements specific to that person. 2.2. What kind of personal data does EuroCave collect? EuroCave is likely to collect your Personal Data, notably: your title, surname, first name, postal address, email address, password, telephone number, IP address, browsing and connection data, order history, delivery incidents, claims and payment information. When personal data is being collected, information to be completed by users which is compulsory in nature is indicated by an asterisk. If you do not want to provide this information, which is considered essential, you will not be able to use certain services or functionalities on our websites. 2.3. How does EuroCave collect Personal Data? EuroCave can collect Personal Data from you, or receive it from you (via our websites, questionnaires, application forms and social networks). In this way, this Personal Data can be collected both directly (creation of an account, for example) and indirectly (using cookies, for example). We also carry out web analytics via the Google Analytics tool, we measure, for example, the number of pages viewed, the number of site visits, as well as the activity of visitors to the site and how frequently they return. Your personal data allows us to improve and customise the services that we offer you, notably on our EuroCave applications, mobile sites and websites as well as the information that we send you. EuroCave undertakes to only collect Personal Data for the precise, explicit and legitimate reasons mentioned hereafter and to not subsequently process this data in a way which is incompatible with these reasons. Your personal data is necessary for managing your orders and our commercial relationship. This information shall also be able to be stored as evidence in accordance with regulatory and legal obligations (payment, guarantee, after-sales service, disputes). After placing an order, you will receive notification emails allowing you to track your order (order confirmation, information regarding delivery, etc.). These messages are required in order to allow your orders to be tracked and are sent independently of any choice you make regarding EuroCave newsletters. If you agreed to receive EuroCave newsletters, you shall be able to receive offers from our brand electronically (email, SMS) so that we can update you on our news and inform you of advantages you can benefit from. We measure the opening rate of our electronic messages in order to best adapt them to your requirements. Within the scope of a strict confidentiality and access management policy, only recipients duly authorised by EuroCave can access information that you have communicated to us. In accordance with the purposes for which the Personal Data was initially collected and/or which you subsequently expressly agreed to, your personal data can be communicated to the EuroCave dealer in your sector in order to most effectively find out about you and in this way provide you with the best possible service and, where relevant, send offers which best suit your requirements. Personal Data is also likely to be communicated to partner companies which EuroCave uses within the scope of implementing services and orders notably management, fulfilment, processing and payment. to allow us to link up your various devices (computers, mobile telephone…) and provide a harmonised experience on the various devices that you use. You are informed that your Personal Data can be transmitted by EuroCave, for the purposes defined in these conditions, to companies and partners located in countries outside the European Union which do not have a suitable level of Personal Data protection. Within the scope of transferring your personal information abroad, we inform you that this is governed by the presence of Standard Terms of the European Commission which ICO (British data protection authority) has previously recognized as guaranteeing a sufficient level of protection of privacy and human rights. Whatever the circumstances, EuroCave undertakes to maintain a similar level of personal data protection to that ensured by EuroCave and European legislation. EuroCave only stores Personal Data linked to your account and orders for the time required to carry out the operations for which it is being collected and in accordance with regulations in force. In this way, Personal Data is stored for a duration of 10 years from the date of its collection or after the last contact from you, where relevant (for potential customers) or from the date our commercial relationship is terminated (for customers). Use of your data in relation to social networks and EuroCave applications or services in relation to these social networks is likely to result in the collection and exchange of certain data between social networks and EuroCave. We recommend that you consult the personal data protection policies of social networks in order to find out exactly what information is collected by them and which can be transmitted to EuroCave in relation to its sites and applications as well as the reasons for using your data, notably for advertising purposes. You can directly set data confidentiality and access on social networks. EuroCave collects for its own use certain Personal Data and information in relation to your activity on EuroCave social networks pages or EuroCave applications and sites which use the services of social networks. This data is used for advertising purposes to improve our commercial relationship and the advertisements that are sent to you in order to offer you a customised, social experience. Information gathered by EuroCave for its own use through EuroCave services, sites or applications in relation to social networks is governed by these conditions and conditions specific to EuroCave applications. However, EuroCave is not responsible for how social networks use your data for their own purposes. Our site uses social plug-ins. This notably concerns the small buttons “like”, “share” of third-party social networks such as Facebook, Twitter, Instagram, Google and others that you will find on our applications or websites. They allow you to (“like”) and share information from our websites and applications with your friends on social networks. When you consult a page on our EuroCave sites (Internet or mobile) containing social plug-ins, a connection is established with the servers of social networks (Facebook, Twitter...) which are then informed that you have accessed the corresponding page of the EuroCave site consulted, even if you do not have a Facebook or Twitter user account, and even if you are not signed into your Facebook or Twitter account. If you do not want social networks to post your actions from plug-ins in your accounts on social networks, you must log out of your social networks before visiting our site. The information that you receive from EuroCave shall be able to be customised according to the data that EuroCave collects via social networks. 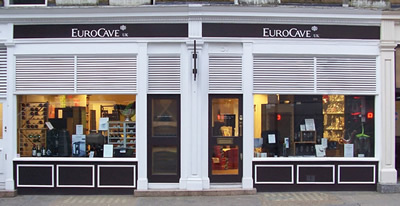 If you use EuroCave services (sites or applications) or join a page belonging to EuroCave’s social networks, EuroCave is likely to receive information about you, notably your public profile and interests communicated on social networks or any other data which you previously authorised us to receive. EuroCave advertisements linked to your profile and the information that you post or share (your interests) shall be able to be displayed on your social network pages. If you do not want social networks or third-parties, including EuroCave, to gather or use information based on your profile or your activity on websites, devices or applications outside of social networks for the purposes of displaying advertisements, we recommend that you refer to the social network conditions in order to find out the methods of setting, unsubscribing or controlling the display of advertisements. A “cookie” is a small text file likely to be saved in a dedicated area of your computer, smartphone or other computer medium when you visit a website. Subject to your consent, EuroCave may gather browsing information using cookies, in a secure way which is limited in time. benefit from our customised advice and be informed about our promotional offers in accordance with consent given by you. We inform you that we can also use advanced targeting functionalities for displaying our advertisements notably “retargeting” functionalities (by displaying advertisements when you are browsing outside our site or by email contact after you have consulted products on our site). These functionalities made possible using cookies are offered by partners, in order to show you advertisements most suited to your requirements and in relation to your recent behaviour on our site. The length of time information from cookies or similar technology is stored cannot, in any circumstances, exceed thirteen (13) months, unless otherwise agreed by you. You can, at any time, change the settings applicable to cookies by configuring the privacy protection parameters of your Internet browser. If you use the EuroCave mobile application, certain Personal Data can be collected by the publishers of operating systems used in your mobile telephone. We recommend that you read the confidentiality policies of operating system publishers (iOS, Android) in order to find out how operating system publishers use your data as data controllers. EuroCave ensures that it protects and safeguards the Personal Data that you have chosen to communicate to it and that it has taken the necessary organisational, electronic and physical protection measures in order to prevent any loss, misuse, damage, destruction or disclosure of personal data. Your Personal Data is stored in our databases which can only be accessed by our employees, dealers and service providers. Our aim is to always store your Personal Data in the safest, most secure way. In compliance with personal data regulations in force, you have the right to be informed, access, unsubscribe, transfer, limit processing, object to, rectify or delete your Personal Data. Any request to exercise your rights must be signed and accompanied by a photocopy of an identity card bearing your signature and must state the address to which we must send the reply. A reply shall be sent to you within one (1) month of receiving the request. You also have the right to contact any appropriate supervisory authority, such as CNIL, if you think that the way in which your Personal Data has been processed contravenes the requirements of applicable Personal Data regulations. EuroCave reserves the right to modify this Personal Data policy at any time. In case of modifications, the last version of this policy published on the websites governs EuroCave’s use of your Personal Data. You shall be able to consult it at any time on this page. For any information on Personal Data protection, you can also consult the UK Data Protection Authority website: https://ico.org.uk/.